Slow feeding in the news from Niagara this Week and Equine Wellness Magazine. 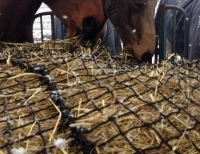 Slow feeding is quickly being accepted as a common sense way to feed horses. Article as printed in the Horse Journal. "...saving about 30% in hay per month" We currently have 4 of our 5 feeders changed over, and early numbers on the first two show we are saving about 30% in hay per month.